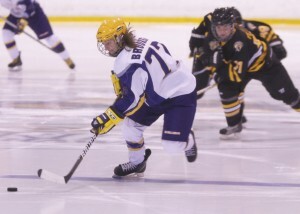 It was business as usual for the Laurier women’s hockey team as they made easy work of the Waterloo Warriors winning 5-0 Sunday night. The game was the team’s only action of the weekend as they improved to 11-1-1 on the year. The combination of Crago, Devon Skeats and Laura Brooker opened the scoring for Laurier in the first period, when Skeats found the back of the net for her team-leading ninth goal of the season. Laurier applied constant pressure, but could only come away with one goal after the first. In the second, the Hawks began to pull away with goals from Brooker, Danelle Im and Tammy Freiburger. With the game well out of reach, captain Fiona Lester would add a goal late in the third period. Lester led the team with three points. Waterloo had a chance to make it a closer contest early in the third when they were awarded a five-on-three power play. But Laurier’s penalty kill finished the night killing off all six penalties. Osborne attributed the success of the penalty kill to the depth of this year’s squad. “I think having people like [Emily] Kekewich and [Erika] Kiviaho; those are two new players this year, and they really have good hockey IQ’s … we’ve always had good penalty killers, but they were also our top scorers and our top players,” he said. “Taking too many penalties, sometimes it would tire them out and their main goal was to create offence for us. So having two or three kids that are specialists around penalty killing … that’s an element we haven’t had in a couple of years. Goaltender Erika Thunder had a relatively quiet night, stopping all 19 shots she faced for her third shutout of the year. Despite a five-game winning streak, Osborne was relieved that the team wasn’t in another one goal game in the third period. But he still saw opportunities for the team to improve. The team is currently tied with Queen’s for the top spot in the Ontario University Athletics (OUA) standings and ranked No. 6 in the country. Brooker believes that Sunday showed the team is a number one contender. Next weekend Laurier hosts Windsor and Western Saturday and Sunday respectively. Osborne says it will be an “acid test” for his team and hopes that they can emerge from that test the undisputed number one team in the OUA.